Am I the only person who’s surprised that Urza’s Rage wasn’t in Dominaria? It has kicker, it references one of the most important characters in Magic’s history, and it is pretty much all upside in either a long or a short game. While burn-heavy decks generally have a reasonable matchup against counterspells without any help, there are few things more frustrating than knowing you only need three more damage to end the game but also knowing that your opponent has a counterspell. In the Invasion era, the “can’t be prevented” kicker clause was used to get around Circles of Protection. Nowadays, those are generally less common in both casual and competitive Magic, but a guaranteed ten damage to anything you can legally target is a pretty good use of huge amounts of mana – Commander decks often generate that much mana, and face pretty large threats to boot. Urza’s Rage is pretty simple: 3 mana, 3 damage. 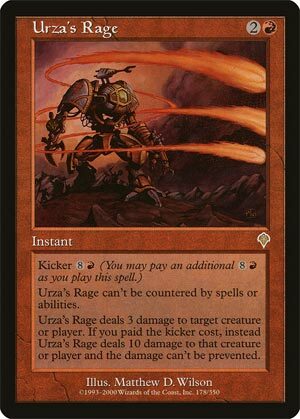 While it’s less efficient than Char, Exquisite Firecraft, or Lightning Strike, it is relevant that Urza’s Rage is uncounterable by spells or abilities, and it does have a pretty flexible color requirement (only one red mana). This alone makes Urza’s Rage a solid tool to take into battle against counterspell-heavy decks, as knowing you’re more likely than not to hit your mark is a good feeling. …and it has another mode. This one is a bit harder to make use of, but it’s a good way to end a game. 12 mana is a lot to ask for, and 12 mana for 10 damage isn’t a great rate of return. But 10 damage that can’t be prevented is definitely a bit more appealing; it breaks through spells like Dromoka’s Command or other means to stop spell damage, and that’s a fair place to be. It makes for a solid finisher (lopping off 10 life in one spell, indeed, is a good way to end a game), but it’s still a good spell before then. It’s not “busted” enough to see play in Legacy, but it’s fun for the whole family elsewhere.